I love everything about Kiana Lodge in Poulsbo for a wedding. And life is always better when you have a lovely couple who appreciates this gorgeous venue as much as I do. 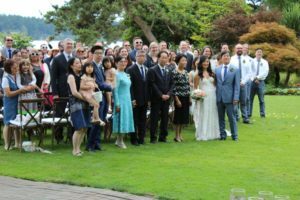 On July 2nd, it was a pleasure for me to join Dave and Annie for their wedding ceremony at Kiana Lodge, surrounded by their family and friends. When I look back on Dave and Annie’s day, I not only remember the two of them as a hugely committed, honoring and sweet couple, but I was taken with their commitment to get a group photo immediately after ceremony. I LOVE a group photo. It’s not easy to get one and takes some post-ceremony logistics to get it right – and when done, it’s a lifetime memento. (the photo to the right is mine and doesn’t do the moment justice!). 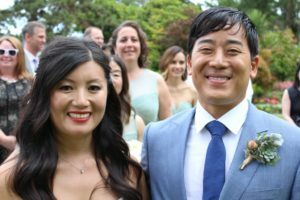 Dave and Annie – wishing you much happiness on your marriage adventure!